Today’s vehicles are more advanced than ever before. The technology that goes into each vehicle is constantly changing, which means the methods and tools needed to repair them are constantly changing, too. Automobile technicians must have current skills and knowledge to keep pace with the ever-changing vehicles. That’s why many NAPA AutoCare centers employ qualified ASE certified technicians. 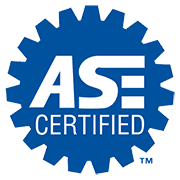 The National Institute for Automotive Service Excellence (ASE) is an independent, non-profit organization that tests and certifies individual automotive repair technicians based on skills, knowledge and experience. We currently staff four ASE Certified Technicians, and two Master 1-L Certified Technicians.